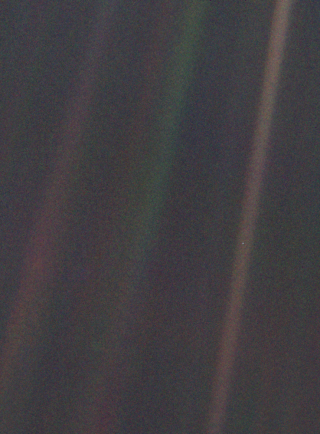 The iconic "pale blue dot" image of Earth taken by the Voyager 1 spacecraft, from a distance of 3.7 billion miles in 1990. Earth is the speck halfway down the brownish streak to the right. The streaks are artifacts, caused by the scattering of sunlight in the probe's optics. The study, published in The Astrophysical Journal, was funded by the NASA Astrobiology Institute's Virtual Planetary Laboratory (VPL). Paper co-author David Catling is an awardee of the agency's Habitable Worlds program. Arguably the most famous Earth "selfie," this "Blue Marble" photo was snapped by Apollo 17 astronauts. Nitrogen, the overwhelming component of Earth's atmosphere, is transparent. An atmosphere that is clear to visible light preferentially scatters short wavelength, bluer light, as opposed to longer wavelength, redder light. As a result of this so-called Rayleigh scattering, blue light appears to come from all directions, and presto: the sky looks blue, as do the oceans. The blue light scatters into space as well, and thus to external observers. Blue, but deadly: the gas giant exoplanet HD 189733b, which is superhot and likely has rains of glass. Several types of worlds, the analysis showed, could trick astronomers into thinking they were perhaps habitable by aping Earth's special hue. The ruse could even be pulled off by planets similar to Mars, whose surface is a rusty red and plainly visible through its currently tenuous, carbon dioxide-dominated atmosphere. With a more substantial atmosphere, though, the Red Planet would look from a great distance like a Pale Blue Planet." An artist's conception of the Wide-Field Infrared Survey Telescope (WFIRST). In the meantime, more work remains to be done in assessing the value of exoplanet colors for clues as to habitability. No matter how detailed the theoretical basis gets, if exoplanetary history is any guide, there will be many shockers in store.